There’s a macOS convention that pressing Command along with the first letter of a push button will press it. 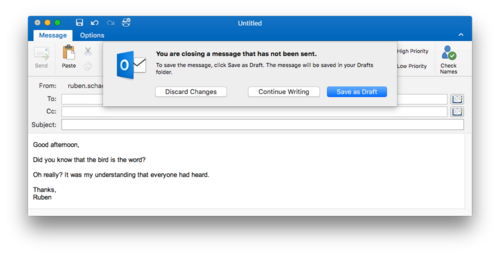 This is most useful for quickly dismissing Save dialog boxes for documents I want to discard. In the above screenshot, I activated the modal dialog with Command+W, to close the window. Pressing Command+D here presses the “Discard Changes” button, which means my fingers haven’t left the keyboard to close this window. As much as I’ve begrugingly switched to Outlook for $reasons, being able to dismiss dialogs with the keyboard has already made me far more productive. If you’re a macOS developer, please implement this.